We are fortunate enough to live in a city with a ridiculous amount of diversity when it comes to restaurants, and one place we frequent often is a ‘hip’ Colombian restaurant (what the hell, it is Brooklyn). When we go there it’s because of two things: 1) We’re friggin starving and are ready to eat till we drop and 2) we want to get drunk. They have very strong drinks, and the food, shall we say, ain’t exactly light either. Maybe the strong drinks are to help your appetite and enable you to eat more? 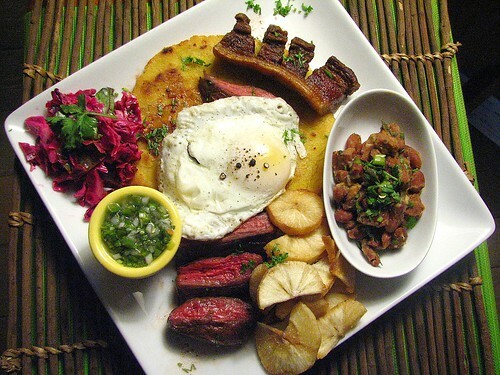 One of the favorite menu items is the very popular and typical Colombian dish Bandeja Paisa. Yes, I wasn’t lying when I called it a “gut buster”. There is no way in hell I’m not unbuttoning my jeans when I decide to order this one. Originating from northwestern Colombia (the province of Antioquia), this dish’s name stems from bandeja, meaning tray or platter, and what the people of the region are known as, paisas, or country-folk. The idea is that this mixed platter would be eaten at lunchtime after a hard morning working in the fields and would be followed (like there would be a choice!) by a lengthy siesta before anything resembling work could resume. 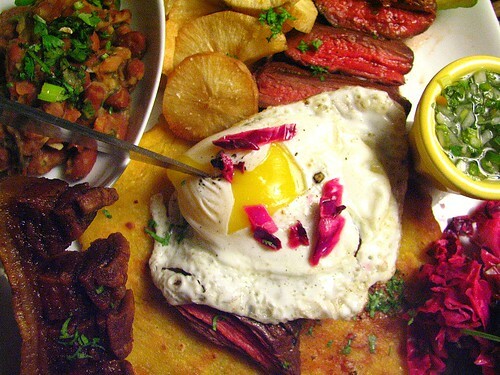 In 2005 the Colombian government planned to make bandeja paisa the national dish, but instead with the name of bandeja montañera (mountaineer’s platter). This move was actually faced with widespread opposition, citing that only a small percentage of the population actually eats bandeja (perhaps unsurprisingly, or they’d all be in cardiac arrest and/or 500lbs). However, the government persisted and now you can find all sorts of Colombian tourism paraphernalia advertising bandeja as the national dish – perhaps in a daring bid to encourage obese gringos to head on down for a feast…? Anyway, like many traditional dishes the exact combination of ingredients/items often differs depending on who you ask, but, again, like many traditional dishes, there are a number of ingredients that all versions contain. 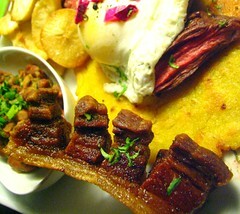 Arepa (a thin shallow-fried corn cake), grilled marinated skirt steak, pork chicharron (crispy, deep-fried pork belly cracklins), a fried egg, chorizo, red beans (stewed red beans) and rice. 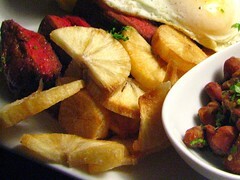 [Note: some versions contain other foods including morcilla (blood sausage), sweet fried plantains, avocado, vinegary shredded red cabbage salad, fried potatoes, tomato sauce, and hogao (aka criollo sauce made with onions, tomatoes, pepper, oregano, cumin, and salt).] 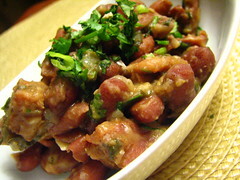 We combined our beans with the chorizo, substituted the rice with yucca fries, and cut the richness of the meal with the traditional Colombian condiment, aji. Estimates vary, but it’s a meal of between 1,500-1,800 calories (that’s most of your daily intake), and yes, that’s right, and it’s all eaten for lunch. I, who can hardly sit up straight at my desk after a sandwich and an apple for my midday repast, find it almost impossible to imagine engaging in manual labor even after only half a plate of this magnitude. Combine this with the nearly year-round equatorial heat that part of Colombia enjoys, and I’d be retiring to my hammock for forty (or more) winks, which is why we tend to save up our bandeja eating for the colder months, and happily for us (but not our cardiologist) those months are on the way. So, get out the largest plate you own, starve yourself for a couple of days ahead of time, consider cancelling your plans for the afternoon, and get stuck into a bandeja paisa – it’s only your waistline at risk! So, because this is a meal made up of many constituent parts, and because, with our version, we tinkered with the traditional ingredients a bit, what follows is basically a run-down of recipes starting with the most time-consuming preparations. See this recipe here we made a while back. Fry yucca rings until golden and crispy. Remove to plate covered with paper towels to drain, and sprinkle with salt. Sprinkle steak lightly with salt, pepper and rub generously with sliced garlic. 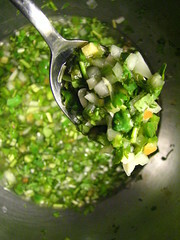 Marinate in olive oil until ready to grill. Heat skillet or grill to screaming hot. Brush marinade off steaks and grill on each side for about 2-3 minutes (depending on thickness – use poke test regularly) for a nice medium-rare. Cover with foil and allow to rest for 5-10minutes. 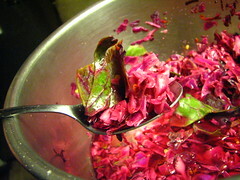 Allow to marinate and grow together for as long as a couple of days. We used the great recipe we found at Nikas Culinaria, and encourage you to do likewise. Then, combine all this goodness on a plate (we suggest you share it with at least one other person unless you want to drift into a food coma you may never come out of) and enjoy with the latin cocktail of your choice (avoid beer, it makes everything swell up), or perhaps, as the Colombians would, accompany it with a few shots of aguardiente! 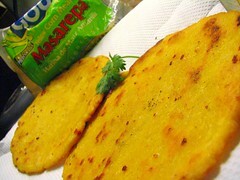 Thank you to about.com for featuring this post in their Colombian food section. Disclaimer: Our dear Colombian friend kindly let us know that our too-styled, “pretty” version of Bandeja Paisa is a bit less authentic because of the way we put things on the plate. 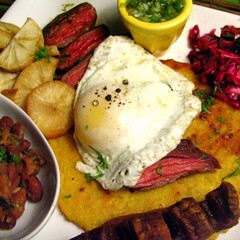 Hear our Juan Camilo discuss Bandeja Paisa and all things Colombian in our exclusive podcast interview. i discovered this in a colombian restaurant about five years ago. i went in starving and thought ‘i don’t want any half arsed portions’ and this seemed to fit the bill. by the end i was having to loosen my belt a couple of notches. but god was it worth it?! now my son (12) and i share one with a couple of empanadas or papas rellenos, and it’s still a tall order. Hola! I’ve been reading your weblog for some time now and finally got the bravery to go ahead and give you a shout out from Dallas Tx!